To build monster legs you need to push your limits. For monster results you need more resistance and confidence in your equipment. The best way to achieve these monster goals is with the Patriot Series, Monster 45 Degree Leg Press from Liberty Fitness Systems. The Liberty Fitness Patriot Series Monster 45 Degree Leg Press is a full commercial grade machine with a monstrous maximum weight resistance capacity of 700kg!! The heavy-duty thick steel support frame and LIFETIME STRUCTURAL WARRANTY* will have you and your clients building legs of steel for many years to come. The structural improvements added to the Monster Leg Press places this machine well above the competition. Four sleeves hold a total weight resistance capacity of 700kg when loaded with Olympic 25kg weight plates. In addition, the Monster 45 Degree Leg Press has four storage sleeves for tidy gym space without the requirement of additional weight plate storage in your gym. Safety is paramount in your gym so you can be confident that your clients are training safely with the built in safety features. 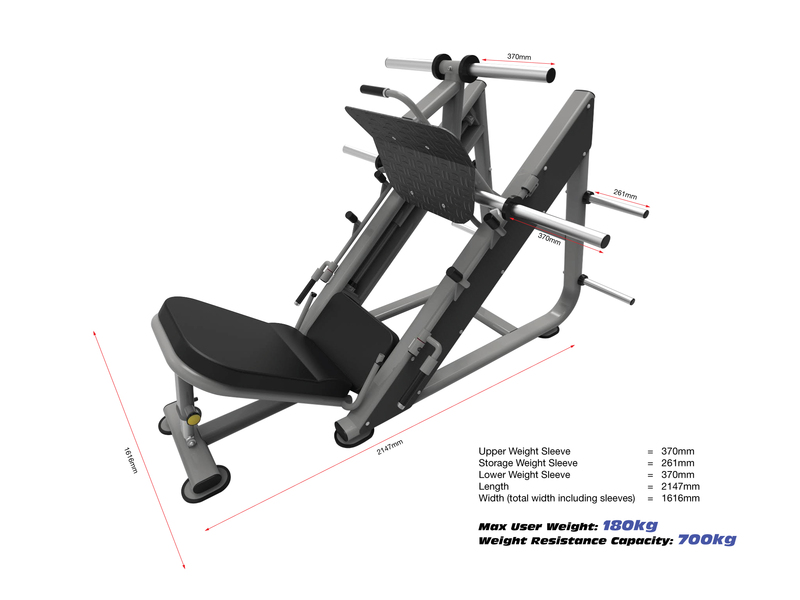 The built-in stop will restrict any movement closer than 66cm to the user's torso and the user will also have manual safety control with safety catchers on either side of the leg press which can be easily activated with one hand. Liberty Fitness Systems is renowned for comfortable, commercial grade padding with rip-stop technology and attractive aesthetics which stand the test of time. The seat is easy to adjust to suit users of various heights and sizes up to a maximum user weight of 180kg. Impress your clients and reach your goals with the Liberty Fitness Patriot Series Monster 45 Degree Leg Press.